Columbia River Gorge, Ore. Today marks 30 years of the Columbia River Gorge National Scenic Area Act protecting the scenic, natural, cultural, and recreational resources of the Columbia River Gorge. The Act created a unique governance framework when it was signed into law on November 17, 1986. The Forest Service works with the Columbia River Gorge Commission to protect resources of the Columbia River Gorge, while fostering compatible economic growth and preserving its unique agricultural landscapes. Collaboration is key to success, and the Scenic Area works with local governments, two states, and treaty tribes to carry out its mission. 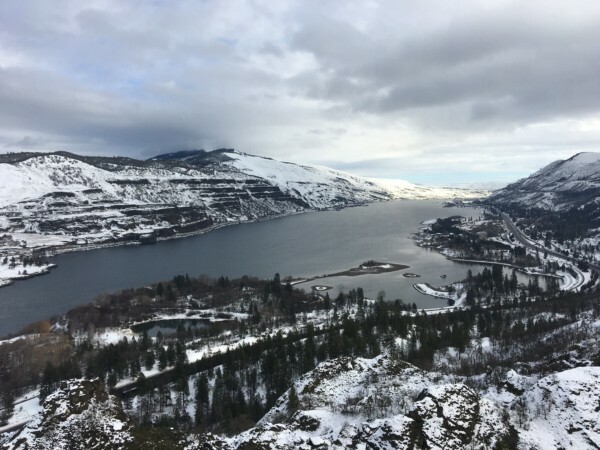 Two of the Scenic Area’s popular hiking trails illustrate how the Forest Service works with communities to protect the Gorge. The first — Eagle Creek Trail on the Oregon side of the Gorge — dates back to the early days of the Forest Service, traversing public lands that are part of the National Forest System. Carved by hand from a cliffside starting in 1916, it has provided 100 years of recreation to campers at Eagle Creek, which itself was the first developed campground in the young Forest Service. What’s striking about this trail is its natural landscape, a forested river canyon that has remained largely unchanged in a century. The second trail, Cape Horn, leads hikers past a series of overlooks on the Washington side of the Gorge, roughly across the Columbia River from Multnomah Falls. It offers an eastward glimpse into the Columbia’s rolling river canyon as it passes through the Cascades. Parts of this landscape nearly became a subdivision, but a desire to protect its views played a role in inspiring the designation of the Columbia River Gorge as a National Scenic Area. Today, its amazing vistas are an experience that can be shared by all. This trail is striking for its diverse landscapes: country lanes and curious goats, majestic forests, rock screes, and ecologically restored lands. Cape Horn illustrates the promise of the National Scenic Area as a unique form of protected area and the possibilities that are available when landscapes are protected by balancing them with sustainable human use. Although the pathway to protecting one of the most popular overlooks in the Gorge was not always easy, diverse groups committed to making it a reality, offering inspiration for what’s possible in the next 30 years. Visitors and locals will undoubtedly celebrate the Scenic Area’s anniversary year in diverse ways: taking selfies at Multnomah Falls, seeking solitude in the Hatfield Wilderness, walking their dogs at Sandy River Delta, soaking in the scenery as they kiteboard or windsurf, or enjoying the fruits of the area’s bountiful agriculture. Consider using the hashtag #LeaveItGorgeous this year as you celebrate and follow Leave No Trace practices to sustain resources for future generations! Find us online at www.fs.usda.gov/crgnsa or on social media at facebook.com/crgnsa or www.twitter.com/crgnsa.